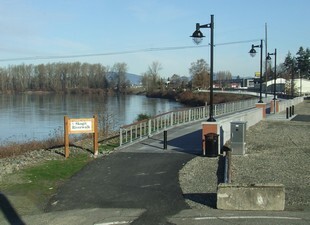 As part of the Mount Vernon Downtown Flood Protection and Revitalization Project, waterfront redevelopment along the Skagit River includes a public riverfront park, a river promenade, and a trail system. The final construction of a 24-foot wide pedestrian trail along the Skagit River and through downtown Mount Vernon is scheduled to be finished in August 2014; residents of Mount Vernon have already begun to use completed sections of the trail. A full overview of the Skagit River Waterfront Redevelopment Project is available here (pdf).